Boat Parade Archives | King Rentals, Inc.King Rentals, Inc. The Cocoa Beach Boat Parade returns Saturday, December 8th! The boat parade is a favorite local tradition held along the Banana River between Highway 520 and the Cocoa Beach Golf Course for over 10 years. The boats in the parade are decked out with Christmas lights and decorations-some even have holiday tunes playing! The parade can been seen all along the Banana River from private residences, empty lots, and some riverfront restaurants. The parade starts at 6:00pm near the Cocoa Beach Causeway. For more information about the parade, visit Cocoa Beach Rotary’s website. If you are planning to visit the Space Coast and are in need of accommodations, give us a call at (321)-784-5046 or e-mail us at [email protected]! Cocoa Beach will be lighting up this weekend for the annual Cocoa Beach Boat Parade. The parade will take place on December 9, and start just south of HWY 520 at 6:00p.m. Onlookers will find good viewing areas all along the Banana River, from HWY 520 to Minutemen Causeway; be sure to check out the Cocoa Beach Rotary Club’s map for detailed route information. Weekend temperatures are expected to drop as a cold front pushes through over the course of Friday night and Saturday morning. Saturday night should be clear, but strong winds and a low temp in the mid-40s will make for a chilly night. For more event and viewing information, visit the Cocoa Beach Boat Parade Facebook page, or read more on the Cocoa Beach Rotary website. If you are planning to visit the Space Coast and are in need of accommodations, give us a call at (321)-784-5046 or e-mail us at [email protected]! The Banana River along Cocoa Beach will be lighting up this weekend for the annual Cocoa Beach Boat Parade. The parade will take place on December 10, and start just south of HWY 520 at 6:00p.m. Onlookers will find good viewing areas all along the Banana River, from HWY 520 to Minutemen Causeway; be sure to check out the Cocoa Beach Rotary Club’s map for detailed route information. Boat parades are a popular event across the state, as a very Floridian way to celebrate the holidays and the Florida lifestyle. The weekend weather forecast indicates a cool, breezy evening. 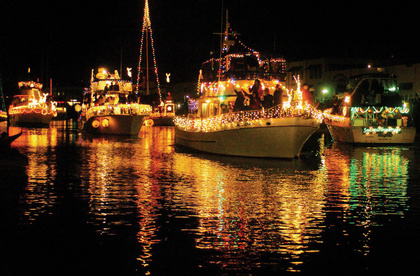 Boats decked in lights and decorations will take to the Banana River this Saturday, December 12, for Cocoa Beach’s annual boat parade. The event is sponsored by the Rotary Club of Cocoa Beach and follows a path along Cocoa Beach’s riverfront from the Beachline all the way south to Minutemen Causeway. The event will begin at 6 p.m. just after dusk; some great public places to view the parade include the Sunset Waterfront Bar and Grill, Wildlife Watersports, and at Manatee Cove Park. The weather forecast indicates beautiful breezy and cool weather for the evening. For more information about the Boat Parade, visit the Cocoa Beach Rotary Club’s website or the event’s Facebook page. If you are planning to visit the Space Coast, give us a call at (321)-784-5046 or e-mail us at [email protected]!